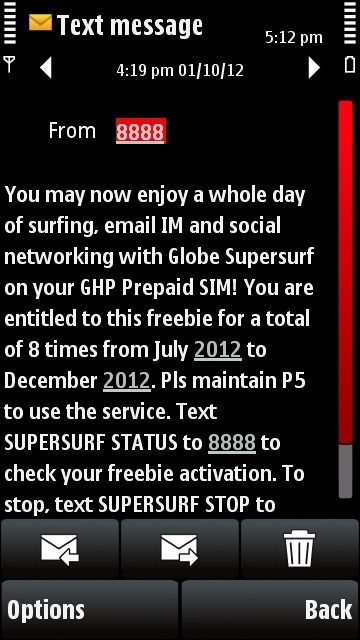 My friend informed me thru text on this new free mobile internet from Globe by just sending SURF4FREE to 8888. SURF4FREE is a promo/freebie from Globe where you can browse or use your mobile internet free valid for 1 day. I hurriedly tried and confirmed working like a magic, you may try this SURF4FREE internet promo from Globe while it’s kicking. What's nice is you can enroll to this promo July 2012 up to December 2012. 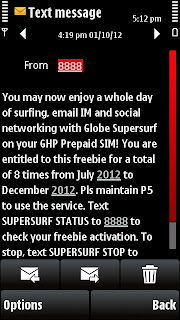 1.Just text SURF4FREE and send it to 8888 and wait for the confirmation from Globe. 2.Maintain P1 for Globe users and P0 for TM. That’s it, you can use any application and connect to the internet for free using Globe SURF4FREE promo. For updates you may visit Globe and TM website or call their hotline for more information. Alternative settings read this post Free Internet Using Opera Mini on Your Mobile.